Bullying is real. It is still something that almost everyone has to cope with at least once in their lives whether at school, work or even at home. Bullying happens when we feel vulnerable, and when others try to take advantage of these vulnerabilities. Bullying may force you to stay quiet, but the truth is, we can speak up. 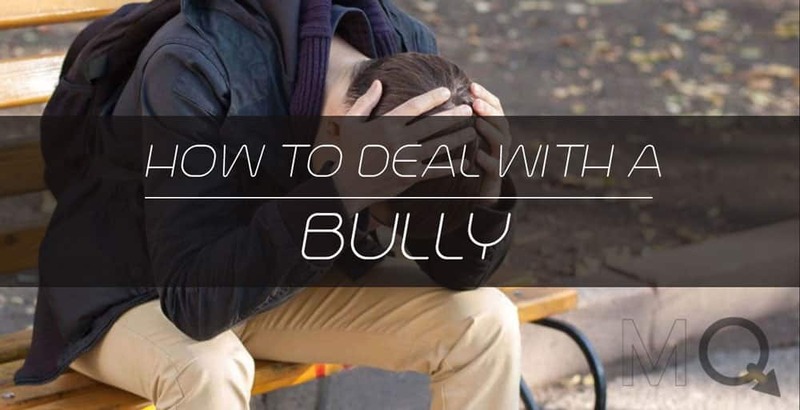 To get you started we wanted to make a full guide on how to deal with a bully, so you can live more confidently, and take on life’s challenges with strength. You have likely already heard, witnessed and even experienced how bullying can traumatize someone whether it’s physically or mentally. The effect of bullying can be a constant struggle and even as you grow up, it can still leave a scar both physically and emotionally. As a teenager or even as an adult, if you run into a bully, there are some simple but effective strategies you can take to both protect yourself and stop bullying in its tracks. As someone who has dealt with bullying first hand, here is some advice I would like to give to all of you. You might think you are not important and no one would even notice, but you have to believe in yourself that this is not the last chapter of your life. It is difficult to believe that things will get better, but I can guarantee you that life comes in phases: the school you go to, the job you are at, the people you meet, no matter how trapped you feel, life always finds a way to move forward. The difficulties and the bullying you are experiencing now will pass, and once you conquer life’s most difficult periods, it will bring out the best of you. This is easier said than done. You may want to build up a wall to escape reality while the real problems remain unsolved, but the truth is, remaining alone and solitary is also part of bullying – to isolate you and to make you believe you are alone. This is why it is so important to find a friend, a family member, or any kind of group of support. Ask for an outside perspective, share how you feel, talk about your problems, your vulnerabilities, and your worries. Don’t go through this alone! Also remember though that you only need to share those things that you are comfortable to share, never feel forced, and don’t feel pressured when you do talk to someone. Use this strategy as a way to ease some of your burdens and build a positive, constructive relationships. Bullies like to feed on your insecurities and silence you. But actually, a lot of bullies are themselves frightened inside; they might not be as strong as they appear to be. Even more, bullies than you imagined had once been bullied themselves, and tormenting others makes them feel stronger and more powerful. Like I mentioned earlier, sometimes what it takes is just to speak up, look into their eyes with your determination, tell them that you would want this to stop, and you might be surprised at the outcome. When people bully you they are going after your insecurities. What is the best way to fight this? Whether you are being bullied for your sexuality, your appearance, or your personality, the best way to stop bullying is to own your insecurities. If they call you fat, be confident in what they say! If they call you a fag. Tell that, “That is right”. If they make fun of your clothes, smile and say thank you. The key here is not to be mean, not to be sarcastic, and not to attack them. But to be genuine and confident! When they see that they don’t make you angry, when they can’t get you to fight, or to cower, and when they realize you are not there to be aggressive, a bully has nothing else to gain from you. This is much easier said than done, and it is hard to put this strategy into practice. After all the things they are saying and doing are mean, and might not be true. But kindness, confrontation and keeping a cool head is the most effective strategy. Like we said before, violence is not the answer, and attacking of being attacked is what you want to avoid at all costs. If things get heated it is best to simply walk away. Don’t escalate, and don’t let your emotions take over. Even if they continue to taunt you, toss those words away. It might bother you the first few times but once you realize that those words can’t hurt you, they will no longer be a threat to you. You have to keep in mind that your best strategy is to stay friendly and stay confident. But sometimes whether provoked or not, you may encounter physical violence. If this happens you do not want to engage. You want to get yourself away quickly and safely. Find a group of people, and make sure to keep a distance. You might think this is lame or embarrassing, but you have to know a person that physical violence even once can make your relationship with a bully even worse, and even more difficult to resolve. Know that you aren’t losing a battle by running away, but are looking at the bigger picture. You can not fight a bully with more bullying. Instead, take away what drives them in the first place. You should never change yourself for them, but learn to love yourself even more, and show them to the world that something that makes you most insecure, is something that they can’t use against you. And finally, when they have nothing left to go after you for, when they see that what makes you different doesn’t make you weak and that their actions don’t cause you anger, frustration or sadness, a bully will go away.